In general, the Church found Muslim control of Christian holy places in Eretz Israel intolerable, especially when reports came from Jerusalem of harassment of Christians visiting the holy sites. As such, in 1095 Pope Urban II called for an army of Christians to conquer Eretz Israel from its Muslim rulers. Indeed, that Christians viewed Islam as a threat was hardly new. In the Eighth Century, for example, Muslims captured Spain and made inroads into France, before being defeated by Charles Martel's Frankish army. Slowly, the Christians fought back, beginning the reconquest of Spain. When the legendary Spaniard El Cid retook the important Spanish city of Valencia from the Muslims, the Christian world was greatly encouraged, feeling that the time was ripe to strike at the Muslim world. In addition, the Church saw as its mission spreading Christian rule, which they termed the "Kingdom of G‑d," over the heathen infidel. On a more secular level, the possibility of attaining great wealth through conquest was a strong attraction. Northwestern Europe had been devastated by bad harvests in the autumn of 1095, and the crusading impulse rescued many serfs and landowners from desperate economic straits. The population had markedly increased in the previous century, and a spirit of restlessness took hold among the masses. Many people were tantalized by the prospect of adventure, riches, and being part of something great and noble. Political considerations also played a major role in the Pope calling for a Crusade. There were disputes between the Pope and secular rulers regarding the limits of the Church's authority. Princes and tribes also often fought among themselves. Therefore, a campaign – a crusade — against a common enemy would unite the warring peoples of Europe under the Pope's rule, thereby unifying the Eastern and Western Churches. Although the Pope viewed the Crusades as a campaign led by a professional, well-trained army, the excursion rapidly evolved into a mass movement, with an estimated 100,000 people dropping everything to join. As a proportion of the European population, a comparable response today would be well over a million people "taking the cross," as it was known. In addition, the Church provided a further incentive by promising that whoever took part in the endeavor would earn a special place in heaven. From that moment, participants were known as Crusaders, after the French word for the crosses affixed to their garments. The First Crusade started out from France in 1095. In order to remain in the good graces of the Crusaders, French Jews supplied funds and food for the journey. However, when some of the Crusaders reached Germany, their mood changed drastically. Among many Crusaders the feeling grew rapidly that before they attacked the heathens in far-off Palestine, there were infidels much closer to home with whom they should contend. In May, 1096, in a period of four weeks frenzied bands of Crusaders struck the Jewish communities of Speyer, Worms, Mainz, and Cologne. The Jews were offered the option of conversion to Christianity or death; the vast majority chose the path of Kiddush HaShem, sanctification of G‑d's name. Rather than submit to forced conversion, in many cases Jews killed their wives and children, and then themselves. In the words of one of the Kinnos (lamentations) recited on Tisha B'Av: "Who can see it and not cry/As the child is slaughtered, the father recites the Shema/ Has such been seen or heard before?" Estimates of the toll taken on the Jewish communities range from 3,000 to 10,000 deaths. These heroic martyrs have been immortalized in Jewish history as saintly people who reached the highest spiritual levels. In the Selichos service for the eve of Rosh HaShanah, Jews implore G‑d to remember those who sacrificed their lives: "The bloods of fathers and sons touched, the bloods of merciful women and their children touched, the bloods of brothers and sisters mixed, the bloods of grooms and brides, wise men and wise women, pious men and pious women, elderly men and women, young men and women, all mingled. O land, do not conceal their blood!" Undaunted, unstoppable, the Crusaders conquered Eretz Israel, reaching Jerusalem in 1099. Once there, they gathered all the Jews of Jerusalem into the central synagogue and set it afire. Other Jews, who had climbed to the roof of Al-Aksa mosque on the Temple Mount, were caught and beheaded. The Crusader leader, Godfrey of Bouillon, wrote to the Pope, “If you want to know what has been done with the enemy found in Jerusalem...our people had their vile blood up to the knees of their horses.” After this victory, the Crusaders retained control of Jerusalem for close to 100 years. The four towns destroyed were major Torah centers of Ashkenazic Jewry. Although Jews resettled and rebuilt these communities, and Ashkenazic Torah centers flourished, the greatness of these cities’ martyred scholars was lost forever – a theme that appears prominently in the Kinnos. 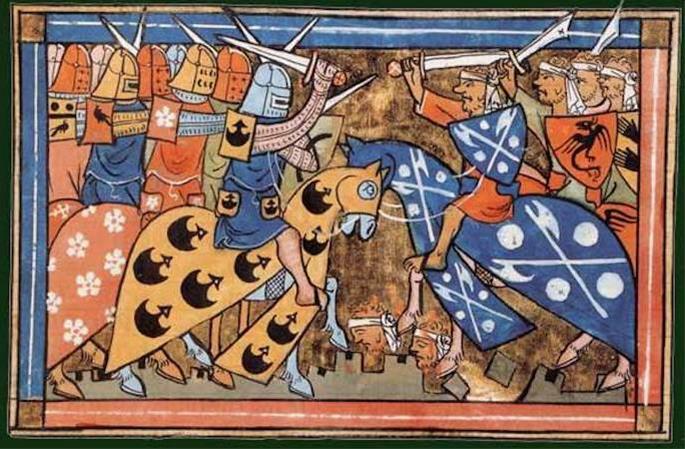 The Crusades set a dangerous precedent — the rise of organized, popular, anti-Jewish uprisings. Although both the Pope and the local authorities were generally opposed to the Crusaders’ excesses in Germany, these leaders’ hostility to Jews caused them to remain apathetic to Jewish suffering, thus they generally did not intervene. After the First Crusade, instances of mob persecution occurred regularly. Therefore, the Crusades can be seen as the source for much of subsequent Christian persecution. In keeping with the traditional Jewish viewpoint, that the beginning of a tragedy is noted, the events of the Crusades are commemorated. As the events of the Crusades and the victory in Jerusalem renewed religious fervor everywhere, among the masses Christian consciousness became greatly heightened. In this new religious climate, traditional anti-Jewish teachings became magnified — and were augmented by new beliefs regarding Jews. In contrast to previous anti-Jewish outbreaks, in which the primary aim was plunder, the Crusades introduced a new element to Christian anti-Jewish assaults: the ideology of total annihilation. “The trail of blood and smoldering ruins left behind in the Jewish communities from France to Palestine…for the first time brought home to the Jewish people, its foes and friends, the utter instability of the Jewish position in the western world…from the First Crusade on, anti-Jewish persecutions exercised a dangerously contagious appeal, which in periods of great emotional stress degenerated into mass psychosis transcending national boundaries." The Second Crusade began in 1146, and struck Jews in France and Germany, including some of the towns destroyed in the First Crusade. A monk named Rudolph told the Crusaders that it was their duty first to kill the Jews at home before proceeding to Palestine. St. Bernard, the Crusade’s official preacher, (assigned that role by the Pope), tried to stop the killings by citing the Church's traditional view that the Jews must be preserved until the return of Yeshu, when they will supposedly serve as witnesses to their own crimes. Although many Jews were killed, compared to the First Crusade, the loss of life in the Second Crusade was far less extensive. The Third Crusade, launched in 1189-90, greatly affected the Jews of England. Jews had first arrived in England in 1066 with William the Conqueror from northern France. The new community thus had had a comparatively artificial origin, and possessed a remarkable homogeneity, being composed almost entirely of financiers and their dependents. A type of late medieval Jewry in composition and occupation, the English community was also typical because of its close subjection to royal control. While the community originated in the main in northern France, of which it was a cultural, linguistic, and economic offshoot, a minority came from Germany, Italy, and Spain – with one or two coming from Russia and the Muslim countries. By the mid-12th Century, Jewish communities were found in most of the greater English cities, Lincoln, Winchester, York, Oxford, Norwich, and Bristol. Nevertheless, the London community was always the most important. In the course of the 12th Century, however, anti-Jewish feeling began to infect the country. In 1130, London’s Jews were fined the then-enormous sum of 22,000 pounds because one of them had supposedly killed a sick man. The world’s first recorded blood libel took place at Norwich in 1144, and was imitated at Gloucester in 1168. (The horrendous anti-Jewish tactic was then exported outside England.) In 1188, a tax of one-fourth the value of its movable property was levied upon all London Jewry. According to the rough contemporary estimate, the amount raised was 60,000 pounds, compared to 70,000 pounds raised from the general population. While the English Jewish community was not large, numbering perhaps several thousand at most, its financial importance was out of proportion to its numbers. As they did elsewhere, British Jews specialized in money lending, dispensing vast sums to ordinary people, noblemen, even the Crown. Aaron of Lincoln (c. 1125–1186) was the greatest English capitalist of his day, whose financial aid made possible the completion of several English monasteries, abbeys, and secular buildings. On Aaron’s death, the Exchequer set up a special department to deal with his property and credits. In 1189, a crowd attacked a delegation of Jews attending the coronation of Richard the Lionheart at Westminster Abbey in London. From there, pogroms broke out in London and spread through many towns. In the city of York, for example, 150 Jews barricaded themselves in a castle known as Clifford's Tower and valiantly resisted the mob. On the Sabbath before Pesach, the Jews, realizing their situation was hopeless, heeded the advice of their spiritual leader, the Tosafist Rabbi Yom Tov of Joigny, and committed mass suicide. When the frenzied crowd scaled the fortress later that day, they discovered seven Jews who had hid — and massacred them. (In 1981, during excavations for a parking lot, an ancient Jewish cemetery was discovered in York, and the bodies were reburied elsewhere.) The jubilant crowd then burned the records of the considerable debts owed to the Jews. Although there is no reliable source for the custom, Jews traditionally have not lived in York, or even spent a night there, since the massacre. Clifford's Tower still stands, and a plaque commemorates the horrific event that took place there. Why not mention Muslims who killed Jews? Were all attacks on Jews done only by Christians? I read that during the 1300's Muslims wiped out a Jewish town killing most if not all the people. I found it on Google but tried a couple of years later to find it again and could not do so, ss if Google had decided not to allow people to find it anymore.